The Election Commission is using 81,860 Ballot Units, 66,358 Control Units and 71,564 VVPATs, including the surplus units, in the Gujarat polls. 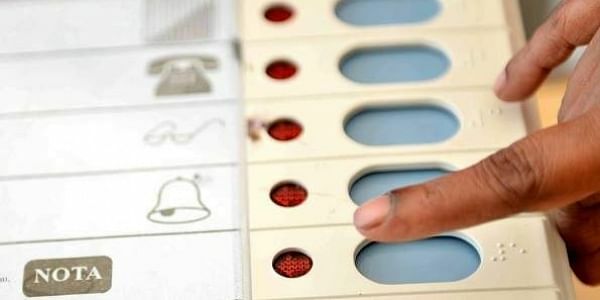 NEW DELHI: A day before the first phase of polling in Gujarat, the Election Commission on Friday sought to allay apprehensions vis-a-vis the integrity of its EVMs by saying that it has put in place "an elaborate framework of system, security protocols and procedural checks" to prevent any "possible misuse" of the voting machines. The EC is also deploying for the first time the Voter Verifiable Paper Audit Trail (VVPAT) machines in all the 50,128 polling stations in the state to "inject greater transparency and credibility" to the voting process. In the VVPAT machine, a paper slip is generated bearing the name and symbol of the candidate to whom the vote has been cast and remains visible to the voter through a transparent window for seven seconds. A mandatory verification of VVPAT paper slips of randomly selected one polling station per assembly constituency will be done across the state. "The comprehensive framework of administrative protocols and procedural safeguards consist of the ‘first level checking' of all EVMs and VVPATs, strict regime of mock polls conducted on every EVM and VVPAT during the first level check, candidate setting and on poll day before the beginning of actual polls, two-stage randomization of machines, stringent security protocols for storage of machines before, during and after the polls, and comprehensive videography and CCTV coverage of all EVM and VVPAT related activities and storage in strong-rooms," the EC said in a statement. Any malfunctioning EVM or VVPAT found during the first level checks were sent to the factories so that the same cannot be used in the election, it said, adding that after the first level checks, the machines are kept in strong room under round the clock security and CCTV coverage. The poll panel also clarified that the sequence of candidates' names is in alphabetical order, first for the national and state recognised parties, followed by other state registered parties, and then by independents. "The sequence in which the candidates appear on the Ballot Unit is contingent on the names of the candidates and their party and cannot be ascertained beforehand. Hence, the serial number of the candidates of any particular party will vary in each constituency and cannot be determined beforehand thereby ruling out any possibility of manipulation," it said. "Once the candidate setting is done, the Ballot Unit of the EVM is also sealed so that nobody has access to the inside of the Ballot Unit too. These seals also bear signatures of candidates/their representatives," it added. The strong rooms will have double lock system, with one key kept with District Election Officer (DEO) and the other with Returning Officer (RO) of the assembly constituency concerned. "Two cordoned security arrangements will be made round the clock for the strong rooms having polled EVMs and VVPATs kept for counting of votes. The central paramilitary forces will man the innermost perimeter security immediately outside the strong room and the state armed police will man the outermost perimeter security," it said. All contesting candidates can depute their representatives to keep a close watch on security arrangement of strong rooms. They will be allowed to stay outside the inner perimeter at a location, which enables them to view the entry points of the strong room, the EC said. "The Commission would like to reassure the people of the country that it would leave no stone unturned in preserving the integrity and credibility of the elections," it said. The EC is using 81,860 Ballot Units, 66,358 Control Units and 71,564 VVPATs, including the surplus units, in the Gujarat polls.